Peter Hickman. Photo: David Yeomans. It was not the best of weekends for Willoughby racer Peter Hickman as he suffered a couple of crashes and came away from Oulton Park with a best finish of 11th in round three of the British Superbike Championship. Throughout free practice Hicky was running well inside the top seven and the first phase of qualifying. But after just two laps of phase two a crash at Old Hall left the team to make some quick repairs to get him back on track for the final sector which determined grid positions for race one. Hicky was late out, but managed one flying lap which elevated him up to eighth for a third-row start. As the race began, Hickman started well and was running in seventh when he lost grip with the front tyre on lap four and went down at Cascades; race over. In race two the Lincolnshire rider again began well and was running in sixth for a couple of laps before dropping back to 10th on lap four. On lap nine Tommy Bridewell overtook him, and although he began to reel him back in, he was unable to make a pass and completed the 18 laps in 11th. “It’s been a tough, frustrating weekend and everything seems to be against me at the moment,” he said. “The bike’s good and we’ve got good pace in practice and qualifying, but when it comes to race day, nothing seems to be coming together at the same time. “I’ve had two crashes this weekend, which isn’t like me, and neither were my fault, but they’ve obviously knocked my confidence. 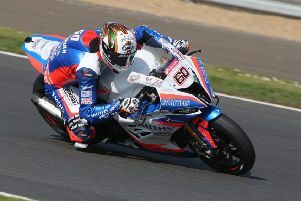 Hickman rides in the FIM World Endurance Championships, in Slovakia, this weekend ahead of the North West 200 and Isle of Man TT.